BC Ferries achieved its first certification from Green Marine. 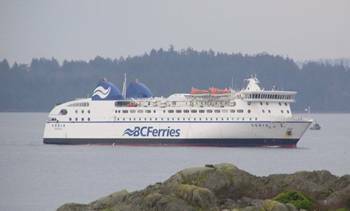 BC Ferries joined Green Marine this year and was certified on May 28, 2015, after having its results reviewed by an independent verifier. Green Marine is a globally recognized, voluntary, industry sustainability initiative for ship operators, ports, terminals and shipyards. It enables participants to reduce their environmental footprint by fostering a culture of continuous improvement and exceeding regulatory compliance. BC Ferries has been certified with Green Marine both as a ship owner and as a terminal operator. Green Marine will act as a benchmarking tool to measure performance and will provide the framework for BC Ferries to develop a continuously improving, robust, environmental program. Under contract to the Province of British Columbia, BC Ferries is the service provider responsible for the delivery of safe, efficient and dependable ferry service along coastal British Columbia.